Travelling through Iran was so unique and we experienced new and interesting things every day we were there. Some were the main tourist attractions and others were simple, local experiences. You'll never run out of things to do in Iran and you could easily spend months exploring all the different parts. But to get you started and give you some inspiration here are twenty awesome things to do in Iran that you shouldn't miss! If you're looking for more detailed travel information read our guide to independent travel in Iran. Iran is home to some of the most beautiful tile work in the world. Every mosque, palace and shrine is covered with the stunning patterns of (mostly) blue tiles. 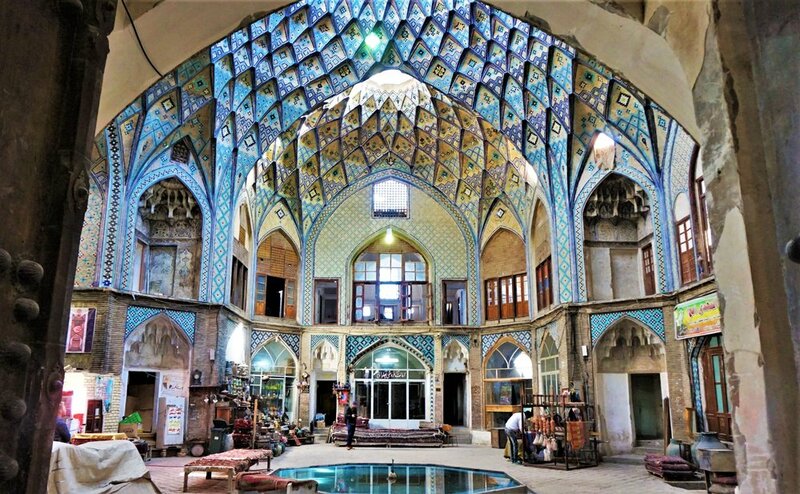 Our favourite places for tiles were Golestan Palace in Tehran, the Pink Mosque in Shiraz and in the main square in Esfahan. Most people don’t travel further north than Tehran during their trip to Iran. 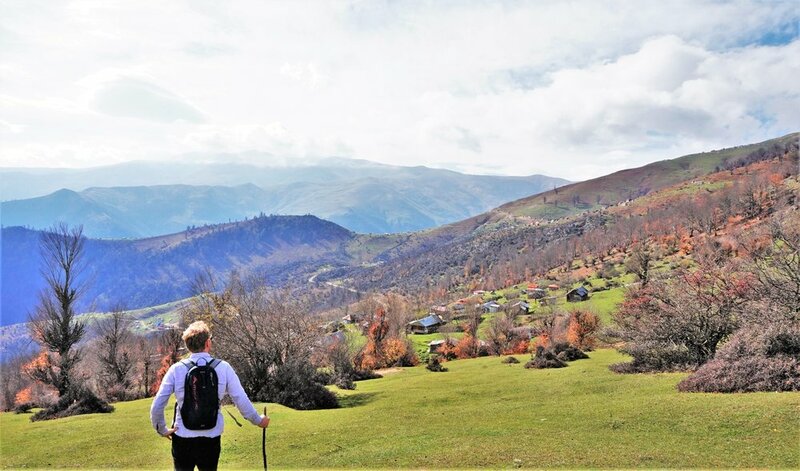 But the nature in the north provides a stark contrast to the south and there are some amazing areas for hiking and enjoying the scenery and fresh mountain air. We loved our time in Rasht and the surrounding areas. This is the traditional Persian way of eating and if you don’t eat at least one meal on the floor during your time in Iran, you’re not doing it right! Although it takes years of sitting like this to be properly comfortable for long periods of time it’s a fun way to share a meal. This is probably the most iconic of all the awesome things to do in Iran. Seeing the morning light coming through the stained-glass windows is a magical experience. It’s 100% worth getting there early and missing the tour groups. We were the first ones to enter and had the place to ourselves for a blissful 20 minutes before anyone else arrived. Official opening time is 8am but they let us in at 7.20am. The first larger groups arrived at around 8.15am. Every city has one of these and they are a great place to experience the hub of local life. Some in the larger cities have souvenir stalls but most just have authentic local stalls selling absolutely everything from clothes to spices. The biggest indoor market in the world is the Tabriz bazaar if you’re looking for a place to get lost. We particularly liked the ones in Kashan and Isfahan. We used the Couchsurfing network but even if you don’t you will no doubt be invited to stay with some locals at least once during your time in Iran. Iranians are some of the most hospitable people in the world and will feed you to bursting with delicious home-cooked food and tea while chatting away about life in Iran. It’s an amazing experience for anyone interested in learning more about the culture, people and history. Iran takes bus travel to a whole new level. 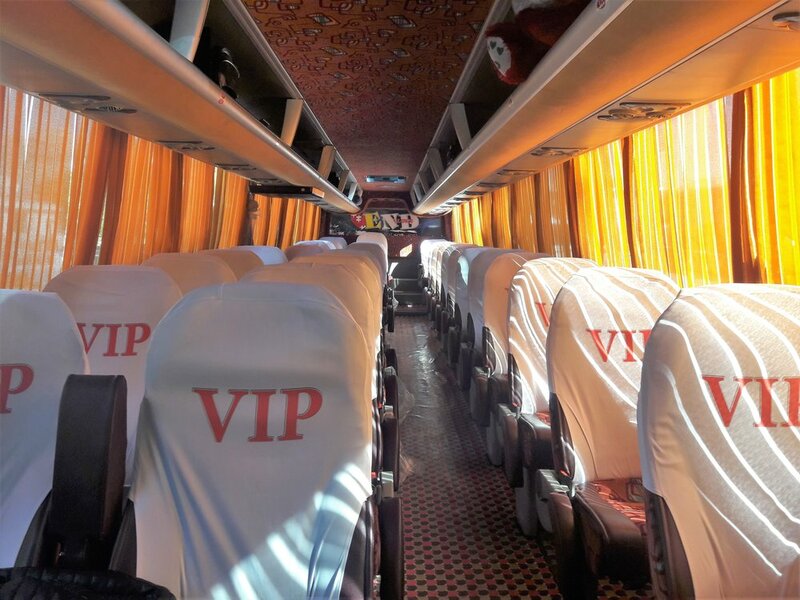 The seats on the V.I.P buses have huge amounts of space, they recline fully for a good night’s sleep and if you’re lucky you’ll get served a snack box to give you throwbacks to your childhood. And if you’re thinking that all this luxury must come with a high price tag, you’re wrong! An overnight bus costs around €9 and a shorter journey just €4. If you want to book tickets in advance have a look at this website. The tickets are slightly more expensive but you can pay with an international credit card. Iran has many desert opportunities and if you have some time you can even camp there. It was too cold to do this when we were there in December but we did manage to see an epic sunset over the dunes. We visited the Maranjab Desert from Kashan and really recommend it as a peaceful and non-trash-filled option! Iran isn’t usually a place that comes to mind when you think of creative freedom and street art. But actually, there are many amazing pieces of art donning the walls of almost every Iranian city. From huge murals along an entire street to more detailed paintings on shop walls. Most schools also have colourfully painted walls surrounding them. No trip to Iran is complete without drinking several hundred litres of tea. Iranians drink tea after every meal, between meals, before bed and at several other intervals during the day. It’s a conversation starter, a way of welcoming guests and also signalling to them it’s time to leave! So sit down and enjoy a chai with a new local friend. The Persian Gulf is home to some gorgeous, chilled out little islands just waiting to be explored. Hormuz has just one small town and lots of incredible nature to explore. Wild camping is legal so grab some friends and a tent and head to one of the secluded little beaches for an incredible sunset and night on the sand. There are several places in Iran where many of the houses are still made with a natural mud cement featuring dome shaped roofs and wind towers. Make sure you find yourself a rooftop and soak in the views which will make you feel like you’re in a Star Wars movie. Sometimes there are ways to walk over the roofs for a different kind of city tour. We had amazing sunset views from our hostel in Yazd. The food in Iran is delicious and if you play your cards right you’ll be invited to a few home-cooked meals. But for a very unique dining experience make sure you find a restaurant that serves dizi. Dizi is a meat, potato and bean stew slow cooked for hours. The stew itself, while delicious, is not as special as the process of eating. It’s served in a clay pot and first, the liquid is drained into a bowl and fresh flatbread broken up into it. Once this has been eaten you take a metal utensil and mash the remaining meal, potato and beans together to be eaten. It’s a very interactive eating experience. This was an unexpected highlight of our trip to Iran. The canyon is carved out by earthquakes, water and wind which have left beautiful swirling patterns and holes in the rock throughout the canyon. You can climb through various holes and along walkways to see more and at one point you can hoist yourself up to the top of the canyon to see it from above. It’s a great place to be for sunset and visiting the canyon is free! Newly opened, this is the largest book shop in Tehran. It’s the kind of place you could spend an entire day, especially if you have kids. Downstairs the bookshop sells a range of books and gifts in both Farsi and English. There are cafes, food trucks and an imagination tunnel! Upstairs features science zones for kids and history exhibitions. It also has a café where kids can prepare and serve food! Entrance is free to the main areas but extra for some of the science areas. Also known as the bridge of 100 secrets, Khajou bridge crosses the mostly empty river running through the middle of Esfahan. The bridge is designed so that if you stand in the arches beneath, sound carries around the domed roof and down the other side. Most evenings local people meet to sing together in the special acoustics of the bridge. It’s free to head along and watch. Iran is not just flat desert. There are many mountainous regions to be explored and enjoy the landscapes from above. We scaled Mt Sofeh in Esfahan for great views over the city and spent a day hiking in the mountains surrounding Yazd. Bolivia is not the only place in the world to see these vast areas of dried salt. There are several around Iran and these can be reached easily in a day trip, often combined with other things. Make sure you take some props for a funny photo! We found the ones near Kashan to be a bit brown but the ones we visited near Sirjan were beautiful. The north of Iran is famous for its cookies and each town produces a different type. Our favourites were the ones in Fuman which not only taste delicious but look like works of art. They are filled with ground walnuts, spices and sugar and served warm and fresh at any of the bakeries lining the streets of the town. If you arrive during the day you will most likely see people sitting outside the bakeries preparing the cookies. Whether it's watching the herds wander through the desert or hanging out with the camels on the beach you can’t miss seeing these guys on your way through Iran. There are even ‘camel crossing’ signs along some of the roads between cities. There’s just something so hilarious and magical about these creatures. This is just the start of all the amazing things to do in Iran and the country is very easy to travel independently. It's safe and the people are so helpful and friendly. A visa on arrival programme was introduced last year and Iran's tourism industry is slowly developing.